As with so many things in this world, fame is all important in the world of winemaking. Thanks to years of hard work, some wine regions are well-known and admired around the world and their prestige needs no introduction. However, there are other regions which, for a variety of reasons, are waiting in the background, waiting for the chance to show us the elegance that their wines can offer too. Penedès and Castilla La Mancha are two perfect examples of areas which have spent many years working well and producing good wines, yet these wines are still inexplicably and relatively unknown. For some reason, these two regions of Spain have an unfair reputation for being regions more destined to making simple and economical table wines rather than quality wines of prestige. But actually, nothing could be further from the truth! The Penedès region is leading what many consider to be the most important revolution in Catalan wine since the pioneering work in Priorat. Penedès wines are lively and expressive. Their farmers and winemakers, curious and well-qualified, are achieving previously unimaginable levels of expressiveness and emotion from local grape varieties such as the Xarel·lo grape. We're sure you won't need any more convincing once you've tried a sip of QX Quatre Xarel·los, one of the star wines from the Mas Candí winery, a cellar at the forefront of the new vibrancy in the world of Catalan wines. The region of La Mancha is another such area whose quality wines remain hidden behind the stereotyped image of cheap wine with a high alcohol content sold in bulk. Perhaps this image is down to the huge size of the region and its heterogeneity in crops and grape varieties. Yet, there are interesting grapes and wines here too, ready for wine-lovers to discover. 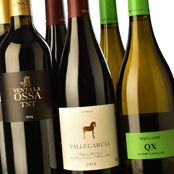 The Tempranillo grape or international varieties such as the Syrah or the Touriga Nacional have a lot to offer; mature, juicy, expressive wines such as the ones you'll find in every bottle of Venta La Ossa TNT or Vallegarcía Syrah. These wines, and those from Mas Candí in Penedès, delight us with the hidden jewels of the beautiful landscapes they come from. The Toledo mountain range (Montes de Toledo) is the hiding place of some of the most surprising wines on the present winemaking stage in Spain. And, without a shred of doubt, one of the best kept secrets is the Vallegarcía Syrah, an intensely-coloured red wine with an amazingly seductive aroma capable of showing us the beauty of this variety. It's a perfect combination of the elegance of French wines with the forcefulness of an Australian one; a combination of spices and maturity, of wind and sun. It has a beautiful Picota cherry colour and aromas of ripe red fruits, with a clear hint of liquorice. Wide and long, this complex wine wraps itself around the inside of your mouth. Spices meet with hints of lactic tones, dark chocolate and mocha. The twelve months it spends in French oak make for a gentle tannic structure and a friendly wine – every sip fills the mouth with weight and width, but also with elegance. Violets, smoke, strawberry tree fruit, and a perfect balance between the ripeness of the grapes and a fine vegetal tone reminiscent of half-burnt vine cuttings, all come together to create an irresistible and tantalizing wine. An energetic decanting is best to continue enjoying the apparently endless aromas and sensations the Vallegarcía Syrah can offer. After aeration, it becomes wilder, almost balsamic, while charming hints of cherry candy and subtle tones of liquorice reveal themselves. Only between 5,000 and 7,000 bottles of this exclusive and original red wine are produced each year. The Venta la Ossa TNT is a perfect example of a wine made from a non-native variety which has adapted perfectly to the local land and environment. In this case we are talking about the Touriga Nacional grape which makes up 85% of this wine. This prestigious Portuguese variety has settled in perfectly to its new surroundings in La Mancha. Continental and Mediterranean climates meet at the sandy-clay soils of the Finca La Solana plot and create particular environmental conditions which not all grapes can adapt to. However, the dry conditions and soils suit the Touriga National just fine and it thrives alongside the local Tempranillo as can be seen in the intensity and structure of the wines it produces. The Venta la Ossa TNT is a treasure chest of small cherries, and fresh and juicy fruit spreading very ripe tannins around the mouth. Reminiscences of oak emphasize its glyceric feel and bring a warm note of vanilla to the wine. This glyceric touch widens and spreads the wine as the wild acidity provides balance. Aromas of violets blend with intense notes of toast and malt from the wood, creating a clear example of the ripeness of a Castilla La Mancha wine but with an exotic touch originating from the relatively unusual grape variety used. Prepared with wise hands, this wine achieves an almost perfect balance on tasting before finishing with an elegant and bitter hint of cocoa which throws open a wide range of gastronomic pairings. The QX or Quatre Xarel·los is a precise white wine with an aromatic purity. The extreme care taken with the vineyard work and the minimum intervention in the winery produces an honest wine which is a faithful reflection of its landscape. The young yet knowledgeable team at Mas Candí have created the Quatre Xarel·los (meaning four Xarel·lo grapes) using organic grapes from four different plots vinified in four different materials: oak, acacia, chestnut wood, and clay. Discrete toasted and caramelized tones blend easily with ripe fruit, aromatic herbs, and wild fennel. Thanks to the time spent ageing on its lees, the QX has creaminess and smoothness which fill the mouth and reach the inside of your cheeks. After the first few sips, you start to notice a buttery taste, but it remains in the background leaving the main stage to a pristine fruit which reminds us of fresh quince. Small meadow flowers soothe its fantastic acidity while its wood can be appreciated more through its colour and feel than through its aroma. Salinity and bitter almonds embellish the finish and become clearer after the wine has stood in the glass a few minutes. All of this earns this wine a deserved place among the best Catalan wines every year. Harvesting grapes at their peak moment is the key to the Mediterranean maturity and finding an impeccable balance among the primary aromas, the smoke from the wood, and the fatty feeling of southern wines. The QX exudes typicity and, almost like a great Catalan cava without the sparkle, it transports us to the wonderful landscapes of Catalan vineyards and gives an insight into the warmth of the people working the land.